Junior’s career spans over 35 years of law enforcement and public service experience including his recent position as Deputy Executive Director of the Hudson County Improvement Authority. Prior to that, he served a four-year term as Councilman for the Downtown Ward of Jersey City, along with three terms as Chairman to the Jersey City Redevelopment Agency. He is also the former Chairman of the Jersey City Housing Authority Board of Commissioners, having served in that capacity for a consecutive four years in a row at that time. His career in law enforcement included seven years as a Detective with the Hudson County Prosecutor’s Office and two years with the Narcotics/Gambling Strike Force. In 1985, he was promoted to Senior Detective and assigned to the newly created Special Investigations Unit. There, he specialized in white collar and organized crime investigations. He is a former member of the elite Emergency Services Tactical Unit having concluded his training at the prestigious Prince George County Police Academy located on the outskirts of Washington, D.C. Throughout his life, Junior has been an involved citizen in the Jersey City community. He served as President/Founder of the Fiestas Patronales Committee, an organization that cultivated educational and cultural programs benefiting the Hispanic community and supported organizations such as the Catholic Charities Relief Fund, UNICEF International, the Roberto Clemente Little League, COBRA Baseball League, the Jersey City Boys Club and the anti-drug treatment program, Hogar Crea. His leadership and community activities include serving as President and Advisor to the Jersey City Puerto Rican Parade Committee and being an active member of the Mid-Hudson American Kiwanis Club, the Hispanic Law Enforcement Association of Hudson County, the Roberto Clemente Little League and the Knights of Columbus Paulus Hook Council #475. He has also served as a member of the New Jersey Democratic State Committee, a Jersey City Committeeman and Democratic Ward Leader. 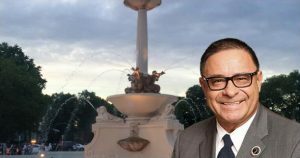 He has been a member of the Statewide Latino Task Force, Lambda Sigma Upsilon Fraternity National Board of Directors, National Association of Latino Elected Officials and the Hispanic Elected Local Officials. Junior has resided in Jersey City for nearly his entire life. He is a graduate of Jersey City’s Public School # 39 and James J. Ferris High School. Junior served in the United States Navy and was selected Company Honor Man at his graduation ceremony for finishing top of his class. He attended Rutgers University in New Brunswick and is the proud father of Eric and Kelly Anne Maldonado.